BOSTON (AP) — Syracuse quarterback Eric Dungey is questionable for the regular-season finale, and Boston College coach Steve Addazio says that’s not much comfort for him. Because backup Tommy DeVito isn’t exactly a pushover, either. Dungey reached for his lower back after a first-quarter run against Notre Dame last week and left the game. Coach Dino Babers gave no update on Dungey’s status, but added the senior was able to get into a hot tub on his own Sunday. The next man up for Syracuse (8-3, 5-2 Atlantic Coast Conference) is DeVito, a redshirt freshman who would be making his first career start. DeVito has appeared in seven games this season, completing just over half of his passes for 525 yards and four touchdowns, with three interceptions. He was 14 of 31 for 105 yards with two interceptions in the 36-3 loss to Notre Dame, when he was also sacked six times. 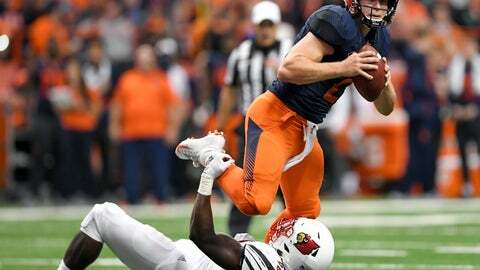 Dungey, who has missed 10 games in four seasons and parts of two others, has compiled 10,612 total yards and needs just 63 rushing yards to reach 2,000. “Eric is probably, maybe the best quarterback in the conference,” Addazio said. “He’s tough and he’s competitive and he’s relentless and he just keeps the chains moving for them. I think he’s a unique exceptional player. Tommy DeVito, the backup, is very, very good, as well. Boston College running back AJ Dillon isn’t back to 100 percent, but Addazio said he was encouraged by the performance against Florida State, when Dillon carried 37 times for 116 yards, with some of the better runs coming near the end of the game. Addazio said Dillon practiced more heading into the Florida State game than he had since he was hurt. And on Sunday, despite his biggest workload of the season, Dillon felt healthier than on the day after any of the other games since the injury. After four straight losing seasons, Syracuse is already eligible for a bowl game for the first time since 2013. The Orange can finish as high as second in the conference with a win on Saturday — or fall into the middle of the pack with a loss. They had been ranked as high as No. 12 in The Associated Press Top 25. BC (7-4, 4-3) was 7-2 and ranked No. 17 after victories against Miami and at Virginia Tech, and the Eagles had a chance at their first 10-win season since Matt Ryan was the quarterback. That would be the next step the program was hoping for after back-to-back 7-6 seasons.